Sizes up to 10'x10' have 87" front wall and 18"x23" windows, larger sizes 96" front wall and 24"x36" windows. The 8'x10' sizes have one window, 8'x12' and larger have two windows. 8'x16' and larger have a 5' double door. 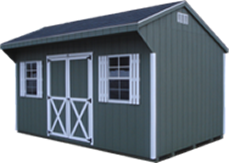 These make great garden sheds and poolside buildings. Add extra windows if you like, or a pressure treated ramp to for easy access with riding mower or wheelbarrow.